Confirmation is open to all 9th-graders and other interested high school students and runs from January through mid-May. 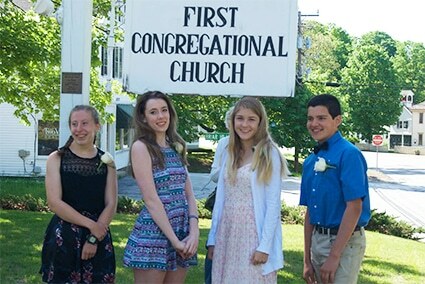 Confirmation is an extended period of time for young people to contemplate their Christian Faith and their commitment to Christian community, specifically First Congregational Church. The purpose of confirmation is to help familiarize the youth with a basic understanding of the Christian faith and the United Church of Christ, as well as with the role of a responsible member in the First Church Community. The decision to be confirmed is the decision to remain connected to Christianity and to be a member of First Church. To help with this decision, students attend several classes, are connected to an adult mentor, participate in a service project, and attend the worship services of several different faiths and denominations.